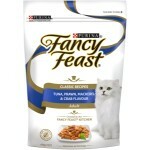 Fancy Feast are a Purina brand. 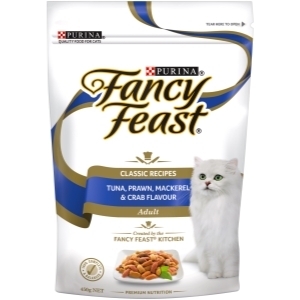 There are currently two class action lawsuits in the US involving Purina, the first with their Beneful dog food allegedly making thousands of dogs sick (our review of Beneful would shed some light), and the second involving fish ingredients found in Fancy Feast sourced from slave ships with abysmal working conditions and human fatalities. For this review I’ll focus on the Gourmet Tuna, Prawn, Mackerel, and Crab recipe as it sounds divine. I love gourmet food, don’t you? Wait, hold on. If you look at the ingredients we find there’s no prawn in the food. There’s no mackerel, and no crab either. What’s going on? The reality is these are just flavourings, like when you buy a pot of noodles and add a sachet of powder to add “flavour”. What we really have is a mixture of processed “not for human consumption” meat product, derived from the remains of chickens, cows, sheep, fish, and whatever else can be thrown in the pot to produce the cheapest meat and meat by-product ingredient possible. There’s very little quality control and it definitely isn’t what I’d consider “gourmet”. The next THREE ingredients are grain, and after that we have soy. They’re not even decent grains, they’re cheap and nasty inclusions of wheat (one of the top causes of allergies) and corn, corn gluten meal (inflates protein levels), and soy (yet another cause of allergies). All these ingredients provide next to no nutrition for a cat and will cause more harm than good. They’re included to increase the profit margin of the Purina company, nothing else. We know that cats are obligate carnivores, so we don’t need rocket science to tell us they shouldn’t be eating this stuff. Animal tallow comes next, an ingredient which would turn your stomach if you saw it being made. It’s a product from the same process that gives us the meat and meat by-products in the #1 spot. I’ll finish the review by mentioning the very last ingredient – food colourings. That ingredient alone should be a red flag. There’s nothing fancy about this food. Don’t buy it.